The Sanctuary Duratub Medium differs from a standard walk-in tub mainly in that it's made from Acrylic instead of Gel Coat Fiberglass. Acrylic is more durable, won't chip or crack under normal conditions, and is easy to clean and stain-resistant. Best Feature: Duratub units offer industrial-grade acrylic shells that are even tougher and more stain resistant than the standard gel-coated fiberglass shells. Our Recommendation: If you like the standard Sanctuary walk-in tub, but want more durability, consider a Duratub. 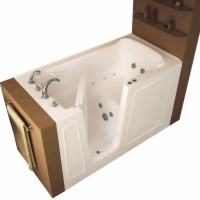 Most options and specifications are identical apart from the material used to build the tub's shell.